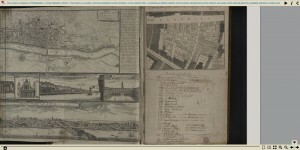 Click the image to view the document in a page-turning viewer. Diary of Charles Ashmead Schaeffer (1843-1898), chemist, United States Civil War veteran, and president of the University of Iowa, 1887-1898. In this diary, he keeps a nearly-daily record of his life and involvement in the United States government’s Civil War efforts. Description of daily chemical work for the Treasury in Boston, Massachusetts, travel, and military combat in Carlisle, Pennsylvania. 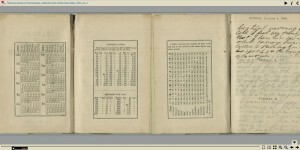 Entries from Alexandria, Virginia; Washington, District of Columbia; Boston and Cambridge, Massachusetts; Philadelphia, Germantown, Harrisburg, and Carlisle, Pennsylvania. Click image to view Volume 3 of the Emilie Davis Diary in a page-turning viewer. The third of three diaries by Emilie Davis, a young African-American woman who lived in Philadelphia during the Civil War. The three diaries, 1863-1865, contain memories of her day-to-day life with mention of some wartime events, including the fall of Vicksburg and draft riots in New York City during 1863. Davis was likely in her late teens or early twenties when she began writing her diary in 1863. 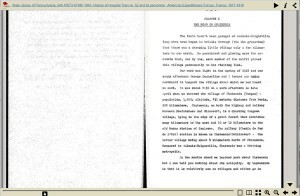 Although a great deal of information is recorded, typical diary entries are not very detailed. 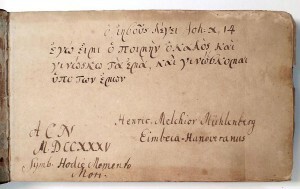 Daily entries provide a glimpse of the life of a young woman in Philadelphia, including her visits with family and friends and her experiences attending weddings, funerals, lectures, school, and church fairs. 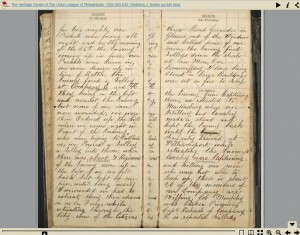 Most of the news Davis recorded in her diary focuses on the Civil War. National events, such as National Fast Day (April 1863), the 1863 New York draft riots, and the 1864 presidential election, are mentioned. In July 1863, she observed that people in the Harrisburg area were fleeing that part of the state and moving towards Philadelphia as a result of the Battle of Gettysburg. Emancipation was also recorded in Emilie’s diary , as was the fall of Vicksburg and President Lincoln’s assassination. Click image to view Volume 1 of the Emilie Davis Diary in a page-turning viewer. The first of three diaries by Emilie Davis, a young African-American woman who lived in Philadelphia during the Civil War. The three diaries, 1863-1865, contain memories of her day-to-day life with mention of some wartime events, including the fall of Vicksburg and draft riots in New York City during 1863. Davis was likely in her late teens or early twenties when she began writing her diary in 1863. 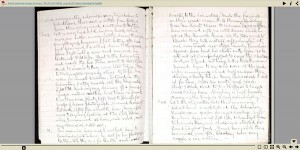 Although a great deal of information is recorded, typical diary entries are not very detailed. 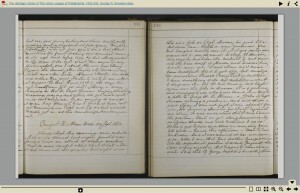 Daily entries provide a glimpse of the life of a young woman in Philadelphia, including her visits with family and friends and her experiences attending weddings, funerals, lectures, school, and church fairs. 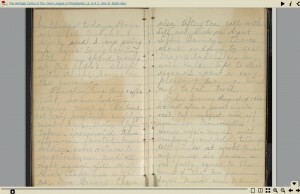 Most of the news Davis recorded in her diary focuses on the Civil War. National events, such as National Fast Day (April 1863), the 1863 New York draft riots, and the 1864 presidential election, are mentioned. In July 1863, she observed that people in the Harrisburg area were fleeing that part of the state and moving towards Philadelphia as a result of the Battle of Gettysburg. Emancipation was also recorded in Emilie’s diary , as was the fall of Vicksburg and President Lincoln’s assassination. Frederick J. Sorber pocket diary while serving as Sergeant, then Captain, in Company E, 29th Pennsylvania Infantry. Sorber’s service brought him throughout Pennsylvania, Maryland, West Virginia, Virginia, Washington, D.C., and Tennessee. He includes recollections of the Battles of Harper’s Ferry (September 12-15, 1862), Chancellorsville (April 30-May 6, 1863), and Lookout Mountain (November 24, 1863). He frequently tracks the miles he marched with his troop. He also notes two instances when he witnessed executions of deserters; the first on June 19, 1863, involving three men, William Grover (Gruver), William McKee, and Christopher Krubert; the second on September 18, involving two men, William Smith and another man. The diary entries are not all Sorber’s; there are frequent entry in another hand. Transcription available. Provenance given in cover letter to transcription. George R. Snowden diary, July – December 1862, with Company I, 142nd Regiment, Pennsylvania Volunteers, gives an account of the difficulties of recruiting the regiment, the politics of getting elected as officer, camp life while building Fort Massachusetts (later Fort Stevens), at the Frederick, MD, hospital, at Warrenton and Acquia Creek, and action in Battle of Fredericksburg and its aftermath. Transcript excerpts by Snowden. John M. Butler Civil War diary, 1862-1863, during his first year of service with the Ohio 101st Volunteer Infantry and his capture and imprisonment (transcription available), with letters, 1862-1864; Allen Butler pocket diary and scrapbook with letters home, 1918, while serving with 313th Infantry, 79th Division, military papers, and photographs; Frederick Y. Butler military papers, 1940’s-1950’s, photographs. Jay Cooke snapshots, and other family objects and ephemera. John M. Butler joined the Union League on November 19, 1866.